Pilot high quality refills and accessories extend the life of Pilot products creating ultimate value; an economic and environmentally-friendly option. This 1.875X2. 25x.5 inch package contains 12 refills. Comes in a variety of colors. Each sold separately. Imported. 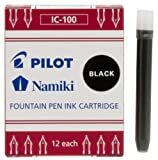 Interested in the Pilot Namiki IC100 Fountain Pen Ink Cartridge, Black, 12 Cartridges per Pack (69100)? Is the price too high? You can easily price watch this product and we'll notify you when the price reaches your target.